Looking for things to do at your next Halloween party? Here are some fun games and activities for adults and teens. This game can be played by seven to twenty people. Two or three players take on the role of werewolves, one assumes the role of seer (the individual who may be able to identify the werewolves), another is the doctor (who can bring people back to life), and the rest are villagers (potential victims of the werewolves unless they can identify the wolves before they are all killed). If the werewolves are discovered before all of the villagers have been slaughtered, the villagers win. If the werewolves manage to kill all of the villagers before they’re identified and eliminated, the werewolves win. A full set of rules can be found at PlayWerewolf.co/rules/. This game can be purchased for $25 at the time of this writing. If you have an active crowd, a Halloween scavenger hunt with prizes can be great fun. One strategy that requires little preparation is to have a list of items that players must photograph around the neighbourhood. Another, which requires more work but allows for greater creativity, is to develop a list of clues and items for guests to find in your home and/or yard. Murder mystery games are classic Halloween crowd pleasers. See the About.com Halloween Murder Mystery Games freebies page for links to a variety of free downloadable games based on various themes. Zombies have risen from the dead. Where is the best place to survive this sudden apocalypse? (Note: you must remain on earth). Excluding sports equipment, tools (power or otherwise, including axes), and knives, what is the best household item to use as a weapon against a flesh-and-blood monster? Your group, being stalked by vicious creatures, has decided to split up. You HAVE to pair up with one of them. Which one do you pick as your partner: the science geek, the jock, the cheerleader, the hoodlum, or the quiet pale girl? See Ghoul Friday’s Have You Learned Anything from Horror Movies page for the full list. If your friends enjoy crafts, this classic Halloween activity that can be made more interesting with prizes for the best carvings or by adding carving/decorating themes (for example, vampire, spider, owl, TV or movie character, scene, etc). Themes could be written on slips of paper and placed in a hat; participants reach into the hat and grab a folded slip of paper to reveal the theme that will guide their carving. How well do you know your friends or family members? Can you guess how they would answer questions or complete phrases? Use this free template from PartyGamesNow or create your own set of questions or half-finished phrases or sentences. Have guests take turns completing the questions or phrases, after which the other participants must guess their answers. Whoever gets the most right answers is the winner. Do your guests love word games? PartyGamesNow offers a free printable template for the Halloween A-Z game. See how many Halloween-related words beginning with each letter of the alphabet players can come up with in eight minutes. The winner can be decided based on the largest number of words or the most creative set of words (by vote). Are your friends horror movie fans? Test their knowledge with a scary movie trivia contest. 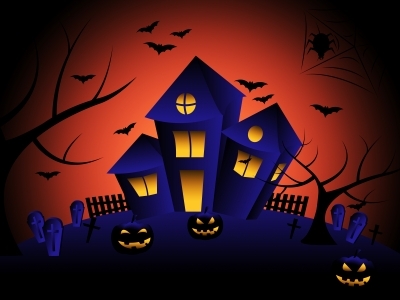 Links to sets of free downloadable horror movie trivia questions can be found on About.com’s Halloween Horror Movie Trivia freebies page. Would your guests enjoy a game that is active but not strenuous and can be played by those of all ages? Murder in the Dark requires only a deck of regular cards to choose the roles of murderer (the ace), police officer who maintains order (the king), detective who must guess the murderer (jack), and potential victims (the other cards). Slips of paper pulled from a hat or box can also be used to assign roles. Once roles are assigned, the lights are turned out and guests walk around in the dark as the murderer seeks his or her victims. The murderer “kills” a victim by touching that person on the shoulder, after which the victim falls down dead. When someone else finds one of these “corpses,” he or she shouts “Murder in the Dark.” Then the lights are turned on and the live players assemble as the detective tries to figure out which of them is the murderer by asking questions such as: “Where were you when someone yelled ‘Murder in the Dark’?” and “Who do you think is the murderer and why?” After gathering information, the detective makes an accusation. If the correct person is chosen, the detective wins; if the wrong person is accused, the murderer wins. Full instructions for the game can be found here.